Park Row, located across from City Hall Park and the future site of the Woolworth Building, was nicknamed "Newspaper Row" because its major buildings of the late 19th century were all associated with the newspaper business. Completed in December 1890, the World Building, officially called the Pulitzer Building, was built as the headquarters of the daily publication. Similar to the Woolworth Building, it was conceived as an expression of the ambitions and business genius of the newspaper's publisher Joseph Pulitzer. At a height of 309 feet to the top of the dome, the World's new home became the highest building in the city and the tallest office building in the world. In an architectural competition, Pulitzer selected George B. Post, architect of the neighboring Times Building (1889), to design his tower. No expense was spared on the elaborate façade of red sandstone and terra cotta, Renaissance ornament, and figurative sculpture, making the tower look like an Old World masonry structure and hiding advanced metal-cage construction that Post used within the walls. Constructed on the northeast corner of Park Row and Frankfort Street, the World Building included more than just office space-it was also a vertical urban factory. Daily editorial meetings with Pulitzer started under the tower's dome, while staff wrote stories in the sunlit upper floors. Production traveled down the building below street level where the other half of the paper's assembly took place. The upper basement provided space for paper storage and linotype machines, with production culminating in the cellar where the enormous presses printed 48,000 eight-page papers per hour. Horse and wagons were poised at loading docks and paperboys waited on the curb to receive folded papers for delivery. Half of the building's 18 stories were occupied by the newspaper's functions with the rest rented to other tenants. Interestingly, leased space housed businesses related to the newspaper industry, such as paper manufacturers, printers, photographers, and advertising agencies. 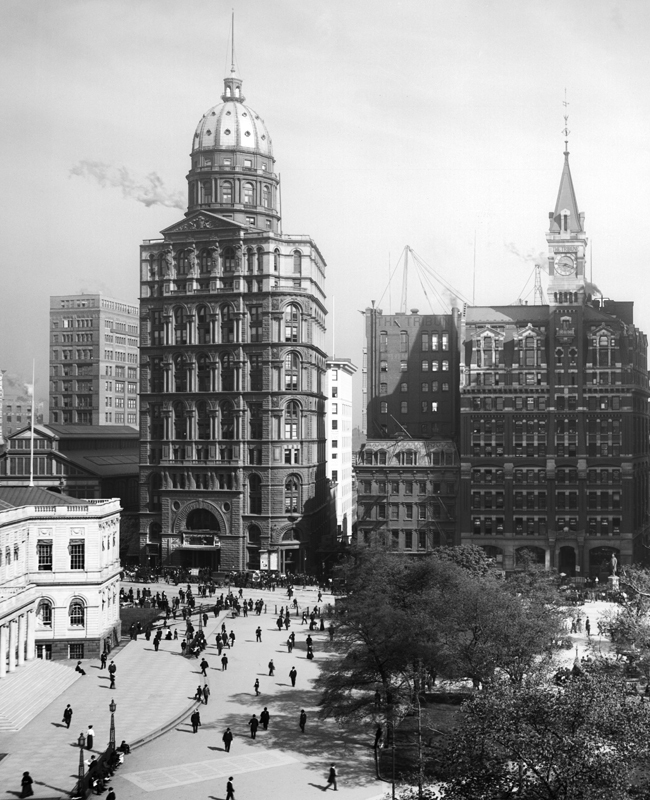 In 1908, the World more than doubled its space by building an annex that filled the block to the east. The tower was demolished in 1955 to accommodate the expanded automobile entrance to the Brooklyn Bridge.